Thursday 24 Had Brigade drill and review today. General Sherman was here and said there is a probability of our going to New Orleans. He will go to Rosecranz. Friday 25 I was brigade officer of the day; the rebels show themselves in considerable numbers in the neighborhood. This morning there were 45 rebs. Captain Scott of the 8th Iowa and sixty sharpshooters went out about one mile and a half to intercept them at Harris’ Plantation. Saturday 26 I did not stir from camp except to take a lesson in sword exercise from Colonel Geddes he is a thorough military man and a good instructor. Lieutenant Joseph Mayer returned this evening having been absent without leave since the 30th ult. he is in very good health. Sunday 27. This was a very lonesome day. Major Keeler arrived from Vicksburg he is unwell yet. 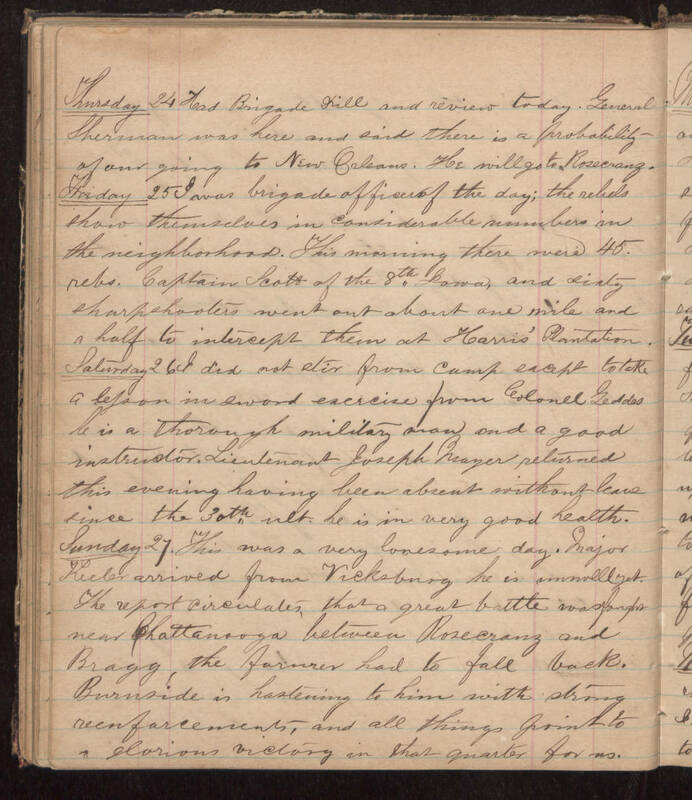 The report circulates that a great battle was fought near Chattanooga between Rosecranz and Bragg, the former had to fall back. Burnside is hastening to him with strong reinforcements, and all things point to a glorious victory in that quarter for us.